For those reading this blog from away, here's some news. It is hot and humid here, August weather in July, 90°F+ in the shade, and 70% or higher humidity. Ugh! To escape the heat and humidity, Saturday, we decided to head for the coast, and went to Georgetown for the Georgetown Conservation Commission's Garden Tour. 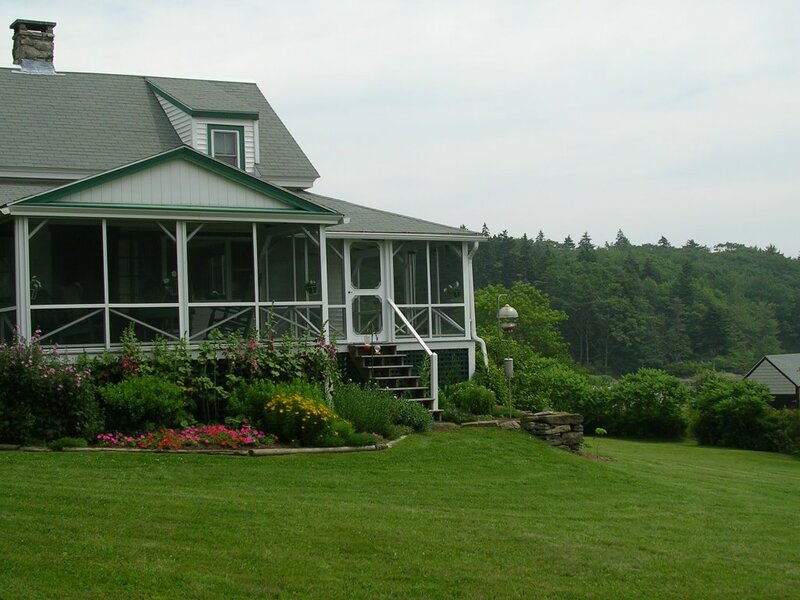 Georgetown is downriver from Richmond, at the end of the Kennebec and Sheepscot Rivers on the eastern side. As always, along the coast it was at least 20° cooler, with a lovely ocean breeze, and haze off the water making the sun seem less intense. We toured 7 of the 10 gardens before we ran out of time. It was interesting, and we met some very nice people. The first garden we saw was the garden of a retired NJ man, who began gardening only about 5 years ago. He had some lovely garden beds in a spectacular setting, and clearly was really enjoying himself. He knew the plants, and was able to point out his favorites and his disappointments, like the deer-devoured hosta garden, eaten to the nub just days before the tour. 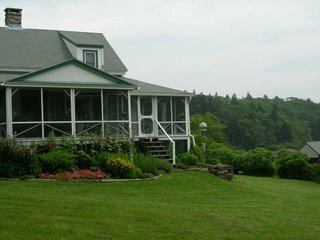 We also saw a lovely home set in the woods, where much of the gardening was really clearing away overgrowth and leaving desired plants. 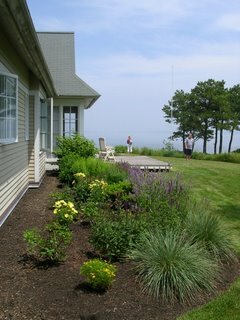 This garden featured lots of bayberry, sweet fern, native viburnums, and lowbush blueberry. 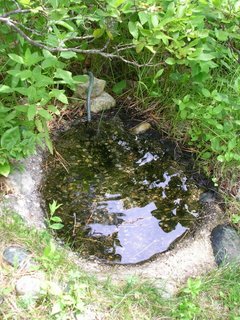 There were a few cultivated garden beds, but my favorite feature was a tiny cast-concrete birdbath, set in the ground at the roots of a large tree, surrounded by blueberries, with a copper tubing dripper keeping it full of water. 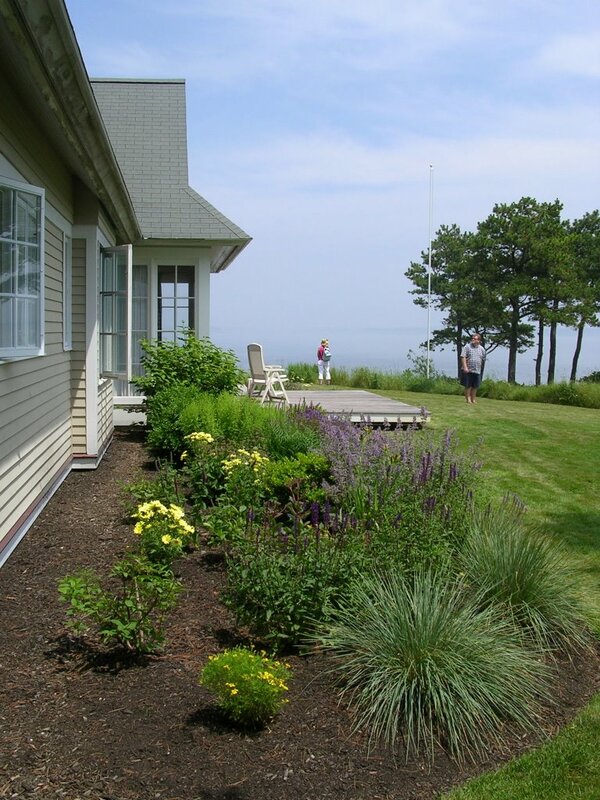 The majority of gardens that we saw, though, were not gardens planned, planted and tended by avid gardeners, they were landscaping for the beautiful oceanside homes, most often planned, planted and maintained by a landscaping service. They were attractive, in that setting what wouldn't be, but they weren't the kind of garden that someone loves and works on. They were more like art installations, there to accent the house, not unique collections of plants tended lovingly by the owner. I suspect many of the owners couln't name any of the plants in the gardens, although they were as a whole pretty common perennials, available at every nursery including the one at Home Depot. For me, much of the joy in gardening lies in sharing and receiving plants from friends and family, and in combining plants and laying out the garden, and watching it grow and change over time. Somehow, I don't think I'd really enjoy my garden if a landscape firm came in and did all the work, even if on the surface having someone else to do all the grunt work sounds fabulous.